Four stroke, V twin, longitudinally mounted, 4 valve per cylinder. 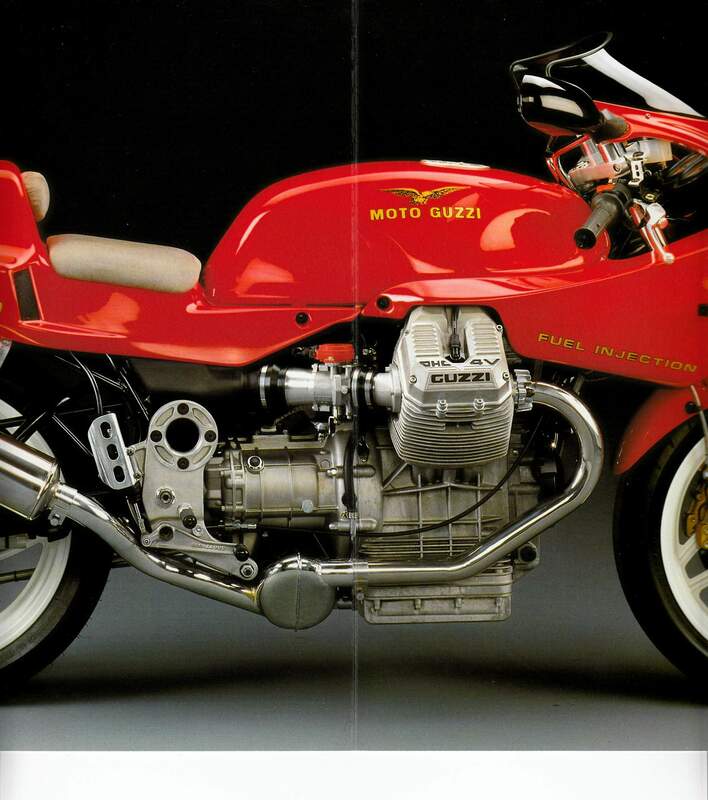 In the mid-1970s Moto Guzzis were exotic Italian superbikes par excellence. The Le Mans was considered one of the finest superbikes on the road, and although the price was considerably higher than the Japanese equivalent, there was no shortage of customers for these Italian thoroughbreds. 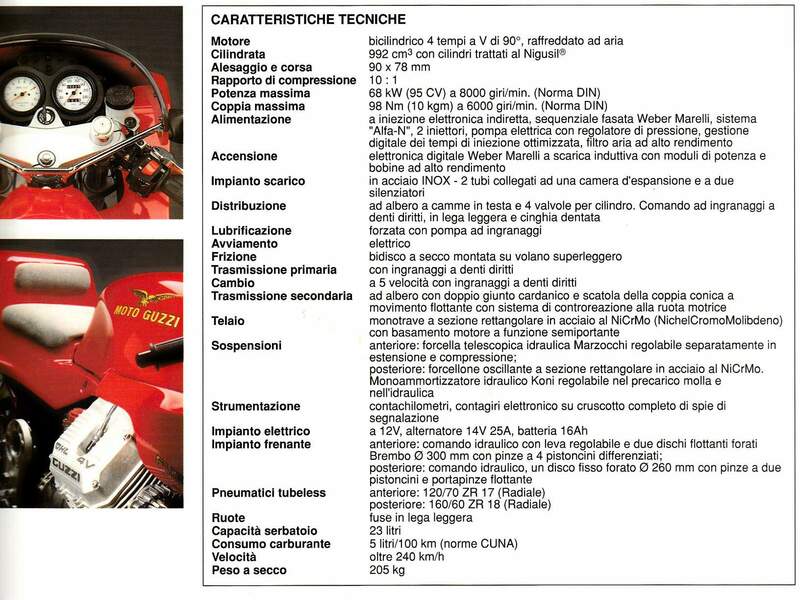 But time and technological innovation wait for no one, and they certainly didn't wait for Moto Guzzi who were content to rest on their laurels rather than try to compete with the increasingly innovative Japanese manufacturers. 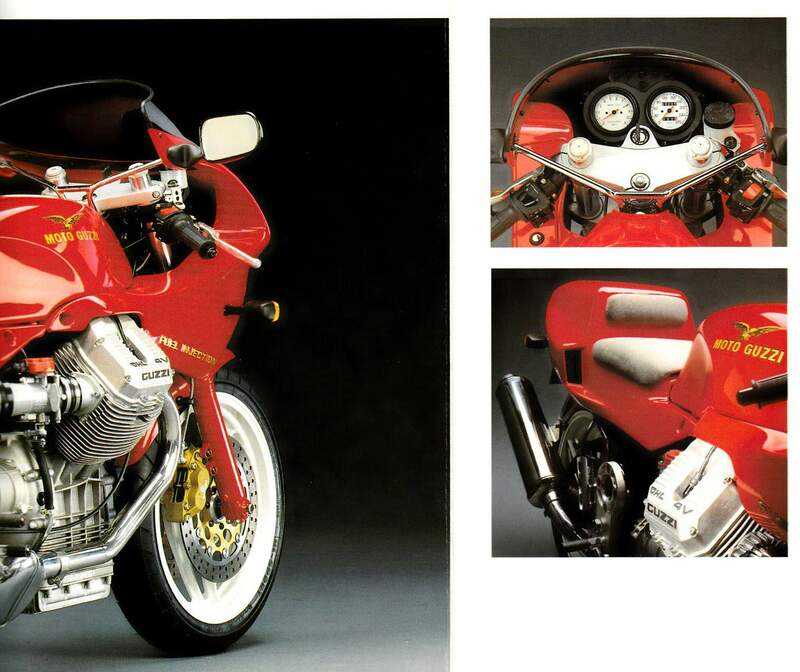 By the mid-1980s Moto Guzzi were still expensive compared to Oriental competitors, but they were no longer a match for the modern Japanese superbike. The slow-revving push-rod four-valve twins could no longer compete on equal terms with the new generation of high-revving DOHC 16-valve fours. 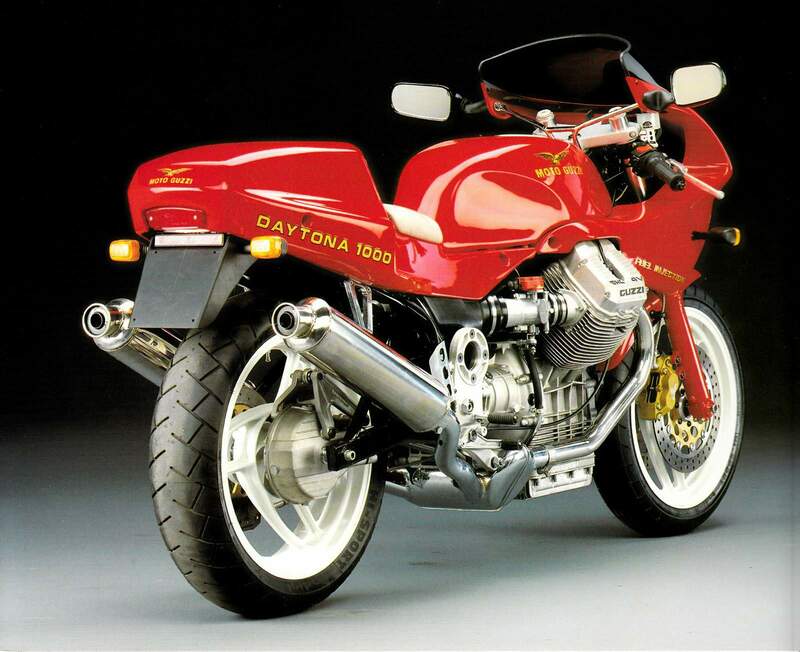 four-valve 1000cc V-twin superbike ready to go into production, and it finally appeared on the streets in 1993. 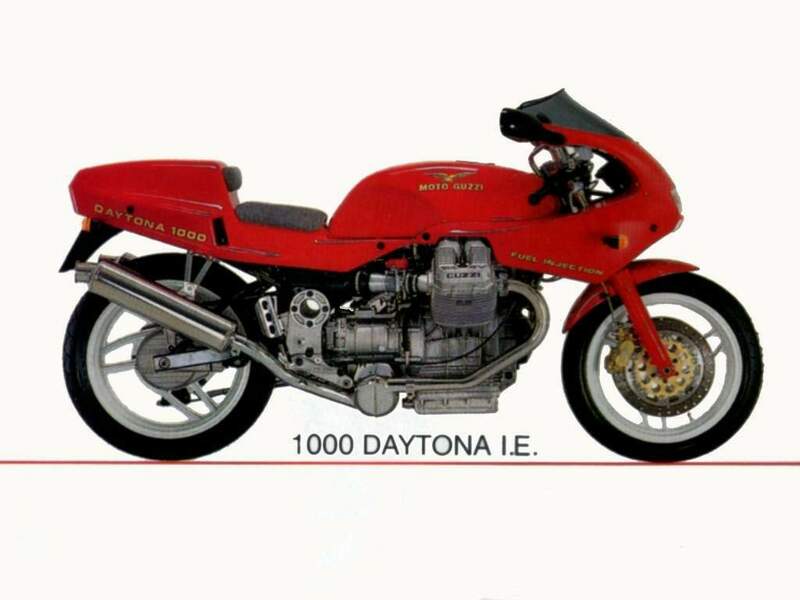 The Daytona 1000 is a true Moto Guzzi in that it is long, low and stable, yet it has a very modern and powerful engine. The 1000cc V-twin motor has four valves per cylinder and is fuel-injected, giving it an output of 95bhp at 8000rpm and producing a healthy 721b/ft of torque at 6000rpm. Okay, so that's not going to give GSX-R1100 owners too many sleepless nights, but for a Moto Guzzi that's pretty impressive and is capable of taking the Daytona 1000 to a genuine top speed of 145mph -not bad for an air-cooled twin. by cantilever linkage rather than a rising-rate arrangement), and a pair of Marzocchi telescopic front forks with rebound damping adjustment, the handling of the Daytona is sure-footed if rather ponderous compared to the latest-generation superbikes from Japan. Riding the Daytona is a curious experience. It's incredibly fast for a Moto Guzzi, it handles surprisingly well for a Moto Guzzi and yet compared to most modern superbikes it still feels quaintly old-fashioned, an endearing mixture of old and new. But it is the styling and traditional feel, combined with modern performance and handling, that makes the Daytona such an exceptional machine. 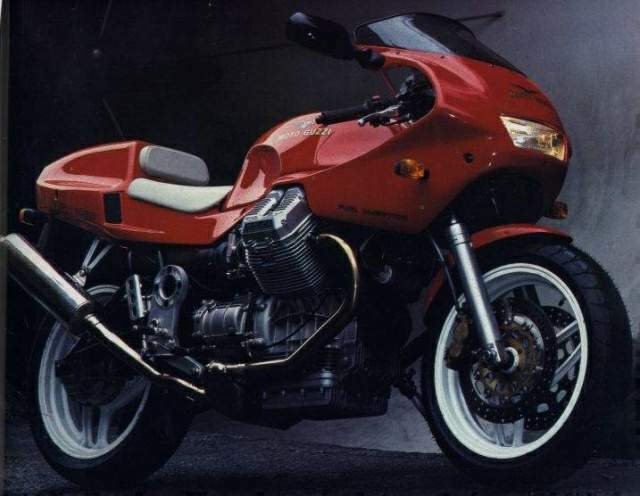 When everyone thought that Moto Guzzi had had their day, they managed to produce a bike that was both beautiful, stylish, totally individual, and yet which retained all that was special and desirable about the marque.